Award winning firm for best Scandinavian design. 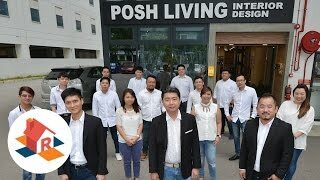 Posh Living is about unique, creative and innovative. Our main goal is to create an environment best suited to your personality, lifestyle and selections. Emphasizing our mantra of timeless design, we want you to enjoy a lasting fondness of your home or office. Surrounded by the sophisticated design quality of timelessness, you would have no worries about an outdated design. We take our customer's needs seriously and we believe that our enthusiasm and experiences will enrich your needs and satisfaction. To transform your dream design into a visually impressive environment that fits your lifestyle, with value added points of picturesque interior. Quality workmanship. Creative innovation. Competitive pricing. Delivery within stipulated time frame. Professional & comprehensive after sales service. To be the leading design specialist, in providing the best in interior design and service.